All Johnny Cash radio specials produced by Joyride Media and hosted by Rodney Crowell. Great for broadcast anytime you want to feature The Man in Black on your station. Four part series of thematic hour-long episodes, each exploring different sides of Cash's personality and creative process. "Till things are brighter, I'm the Man in Black" sang Johnny Cash. He was an American with open eyes, aware of the state of the world, and he cared deeply. Cash shared his opinions on politics without hesitation or compromise, and people listened. His influence helped open the way for artists to express their feelings and views without fear. Audio will be available here by Aug 10, 2005. Please contact Andy Cahn at cahnmedia@comcast.net or 201-386-1736 for more details. One of the first country stars to write most of his own material, Johnny Cash created a songbook to rival Porter and Gershwin. We look into the craft of Cash, how he shaped his stories, told tales of the people and places around him, and influenced the songwriting and arranging of artists now. Audio will be available here by Aug 10, 2005. Please contact Andy Cahn at cahnmedia@comcast.net or 201-386-1736 for more details. When it comes to his spiritual life, Johnny Cash showed no fear in spreading the word. We follow the complicated religious journey of Cash's life, from pious beginnings, straying from the church, betrayal of beliefs and return to the fold. Along the way, Cash wrote fascinating songs that reflect his struggle with belief and human nature. Audio will be available here by Aug 10, 2005. Please contact Andy Cahn at cahnmedia@comcast.net or 201-386-1736 for more details. I took Johnny Cash 12 years to record one of his live prison shows, but it wasn't easy. He was threatened against doing it, warned it would ruin his career, but Cash's instincts were dead on. He just went ahead and recorded at Folsom Prison in 1968 and never sounded so raw and alive. The live album was a huge hit, and followed by the even bigger "Johnny Cash at San Quentin" - his first #1 album on the pop charts. In this hour we explore how Cash's concert at San Quentin came about, went down and the wake it left behind. Your listeners will hear Johnny Cash on the edge, plowing through well-known songs and premiering new ones that stated, "San Quentin, I hope you rot and burn in hell." Needless to say, he almost started a riot in a room full of very bad men. The program also features a few songs from the show not included on the original live album. For an inside view, we'll hear about prison life from the prisoners and prison guards, taken from the documentary "Johnny Cash in San Quentin." The original producer, Bob Johnston, speaks about the excitement and fear, as does Jim Marshall, photographer of the famous "Johnny flipping the bird at San Quentin" photo. We'll also hear about Johnny Cash's views on the lock-up from bassist Marshall Grant, son John Carter Cash, singer/songwriter Larry Gatlin and music writer Anthony DeCurtis. More shows about Cash, with more detailed explorations of topics touched on in earlier productions - religion, home demos, collaborating with others on his TV variety show, and tributes paid by current artists. IN 1969, JOHNNY CASH WAS AT THE HEIGHT OF HIS FAME. THAT SUMMER, THE ABC TELEVISION NETWORK ASKED HIM TO HOST A MUSIC VARIETY PROGRAM. THE JOHNNY CASH SHOW LASTED FOR 58 EPISODES OVER THE COURSE OF THREE YEARS, AND NOTHING LIKE IT HAS BEEN SEEN SINCE. CASH WAS FIRST AND FOREMOST A LOVER OF MUSIC, AND HIS TASTES RAN WIDE. THE TALENT THAT HE BROUGHT TO HIS TELEVISION SHOW MIRRORED THAT, FROM GEORGE JONES TO RAY CHARLES TO DEREK AND THE DOMINOS. IT WAS TRULY A VARIETY SHOW LIKE NONE BEFORE IT. WE'LL HEAR SOME OF THE GROUND THAT THE JOHNNY CASH SHOW BROKE. WE'LL ALSO TALK TO ROSANNE CASH, KRIS KRISTOFFERSON, JOHN CARTER CASH, PATRICK CARR, BILL WALKER, MARTY STUART AND BOB HILBURN. To receive a copy of this program on CD, please contact eric.molk@sonybmg.com JOHNNY CASH: A MAN AND HIS VISION * New PBS special featuring highlights from the "Johnny Cash Show." * Airs on PBS stations 11/22 - 12/15 * Consider airing this special in conjunction with TV airdates in your market. * Click on "For Stations" to find the carriage report PDF file (updated 11/15). One-hour radio documentary explores Johnny Cash's love for Gospel music, his roots in the church, and the stories behind his greatest Gospel recordings and performances. One-hour music intensive documentary hosted by Rodney Crowell explores Johnny Cash?s ?Personal File? home recording archive. New radio special from the people behind the award-winning four-part series, "Johnny Cash: The Legend." 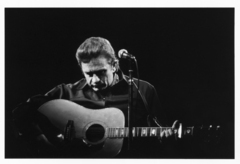 Throughout the 1970s and early 1980s, Johnny Cash sat down with an acoustic guitar at home and recorded tape after tape of songs that he loved, both old and new. When he finished, the tape would be marked ?Personal File? and put in a vault that has just recently been re-opened. Throughout this one-hour program, Cash is heard having fun and telling stories of his childhood and deep faith on these solo acoustic recordings. The sparse and loose arrangements of original songs and covers from the "Personal File" tapes also served as the template for Cash's acclaimed American Recordings albums produced by Rick Rubin between 1994 and his death in 2003. Comments about these recordings and Cash?s love of music come from his son, John Carter Cash, daughter Roseanne Cash, Marty Stuart, Cowboy Jack Clement, journalist Anthony DeCurtis and biographer Patrick Carr. Johnny Cash made a mark on the world that went well beyond his songs. Musically, spiritually, politically – he was a complex man with qualities that generations have held in high regard. In this one hour radio special, you’ll hear from many of his old friends and new admirers - including Willie Nelson, Kris Kristofferson, Sheryl Crow, Shelby Lynne, Rhett Miller, Brandi Carlisle, Amy Lee, Lucinda Williams, Shooter Jennings and Sam Beam. More programs about his daughter, Rosanne Cash, and how her life and music are inspired by her father. Intimate acoustic set by Rosanne Cash and her husband, John Leventhal in their living room (aka Zone C). Includes exclusive live recordings of songs from throughout her career, as chosen exclusively by twitter requests. Hosted by Lizz Winstead. This program includes the following exclusive live recordings unavailable anywhere else, recorded live a Rosanne Cash's home on November 2, 2011. Songs are written solely by Rosanne Cash unless otherwise noted.